As quickly as No.8-seed USF men’s basketball started the AAC Tournament, it was on its way home, losing to No. 9-seed UConn 80-73 in the first game of the tournament Thursday at FedEx Forum in Memphis. UConn led by as many as 18 points late in the first half thanks to a 3-point performance for the ages. The Huskies shot 13-of-24 from 3-point range, including an AAC Tournament record nine in the first half. In the previous matchup between the two teams on March 3, UConn went 0-of-15 from 3-point range. Trailing by 15 points with under five minutes to go, USF went on a 10-1 run, eventually cutting the deficit to five with 34 seconds left in the game. UConn went 7-of-8 from the free-throw line in the late stages of the game to keep the Bulls away. Laquincy Rideau led all USF scorers with 19 points. Rideau also recorded seven assists, moving him into ninth place on the USF single-season assist list with 162. It was the eighth time this season that Rideau recorded at least seven assists. Several USF basketball players earned AAC postseason honors, including a first for USF men’s basketball. Laquincy Rideau took home the AAC Defensive Player of the Year award, the conference announced last week. Rideau is the first player in program history (48 seasons) to take home a conference defensive player of the year award. Rideau’s season included setting the program record for steals in a season on Feb. 7 and the AAC’s record on Feb. 13. His award was the first time since 2001 a USF player took home an individual postseason conference award. Rideau may have been the first Bull in almost 20 years to earn an individual postseason award, but he wasn’t the only player to earn one this year. Alexis Yetna was named the AAC Freshman of the Year by the conference last week. Yetna is the second player in program history to take home a conference freshman of the year award and the first in 40 years. Yetna finished the regular season with more individual double-doubles than six teams in the AAC. 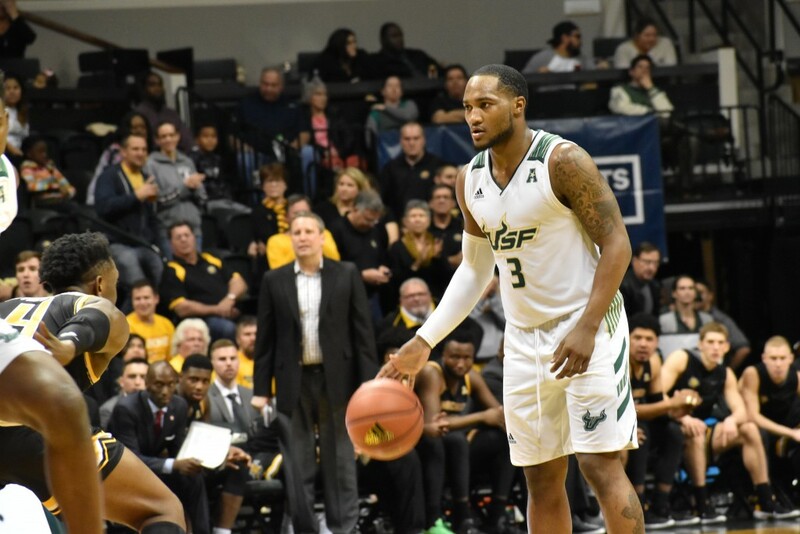 Additionally, Rideau and David Collins earned spots on the AAC All-Conference third team, USF’s first representation on an AAC All-Conference team since the conference’s inception. Yetna earned a spot on the all-freshman team. For USF women’s basketball, Enna Pehadzic earned a spot on the AAC All-Conference second team while Sydni Harvey was named to the all-freshman team. No. 5-seed USF women’s basketball won two games in its AAC Tournament appearance last weekend in Uncasville, Connecticut. After defeating No. 12-seed Tulane 61-52 in the tournament opener, a second-half surge helped the Bulls upset No. 4-seed Houston 72-55 in the tournament quarterfinals. In the game against Houston, USF trailed by one point at the half before exploding for a 21-point third quarter, outscoring the Cougars by 15. The big blow was a 13-2 run, led by 3-pointers from Enna Pehadzic and Sydni Harvey. USF eventually fell to No. 1-seed UConn 81-45 in the tournament semifinals. Despite an injury-plagued season, the Bulls advanced to the AAC Tournament semifinals for the sixth straight season. Over the course of USF’s appearance in the tournament, Pehadzic led the way in scoring with 45 points, earning her a spot on the AAC All-Tournament Team. Other than one representative from UCF, Pehadzic was the only non-UConn player to be selected to the six-player team.